Wilhelm Conrad Rontgen was awarded the 1901 Nobel Prize in Physics "in recognition of the extraordinary services he has rendered by the discovery of the remarkable rays subsequently named after him." March 27, 1845Birth, Lennep, Prussia, Remscheid (Germany). 1869Obtained Doctorate in Physics without prior credentials, University of Zurich (Universität Zürich), Zurich (Switzerland). 1874Lecturer, University of Strasbourg (Université de Strasbourg), Strasbourg (France). 1875Professor, Academy of Agriculture, University of Hohenheim (Landwirtschaftliche Hochschule Hohenheim. Institut für Physik und Meteorologie), Württemberg (Germany). 1876Professor of Physics, University of Strasbourg (Université de Strasbourg), Strasbourg (France). 1879Chair of Physics, University of Giessen (Justus Liebig-Universität Giessen), Giessen (Germany : Landkreis). 1888Chair of Physics, University of Wurzburg (Bayerische Julius-Maximilians-Universität Würzburg), Wurzburg (Germany). 1896Awarded the Matteucci Medal, Accademia nazionale delle scienze dette dei XL. 1896Awarded the Rumford Medal, Royal Society. 1897Awarded the Elliott Cresson Medal, Franklin Institute. 1900 – 1923Chair of Physics, University of Munich (Universität München), Munich (Germany). 1901Awarded the first Nobel Prize in Physics "in recognition of the extraordinary services he has rendered by the discovery of the remarkable rays subsequently named after him". 1907Member, Royal Netherlands Academy of Arts and Sciences (Koninklijke Nederlandse Akademie van Wetenschappen). Advisor at University of Zurich. Adivsed by Rontgen at University of Munich (Universität München). Advised by Rontgen at University of Munich (Universität München). Advisor at University of Zurich, University of Wurzburg, and University of Strasbourg. Doctoral advisor at University of Zurich. Both worked at University of Wurzburg. Lecturer and Professor of Physics. Awarded the Matteucci Medal (1896). Awarded the Elliott Cresson Medal (1897). Awarded the Rumford Medal (1896). Received Doctorate in Physics (1869). John Tatlock letters from scientists, 1858-1908. Silvanus Thompson letters to Wilhelm Röntgen, 1897. W. Röntgen, M. Planck, and A. Einstein letters regarding Siemens prize, 1916. Wilhelm Conrad Rontgen correspondence, 1901-1984. Wilhelm Röntgen correspondence concerning the purchase of vacuum tubes, 1896. Collections relevent to the history of physics and allied science. Lectures by William Coolidge, L. E. Etter, and Niels Bohr [sound recording], 1938. Oral history interview with Heinz Pick, 1982 October 5. Oral History interview with Paul S. Epstein, 1965. Oral history interview with Peter J. W. Debye, 1962 May 3 and 4. Oral history interview with Robert Wichard Pohl, 1963 June 25. Oral history interview with Walter Friedrich, 1963 May 15. Robert Wichard Pohl papers, 1900-1973. Röntgen rays : memoirs by Röntgen, Stokes, and J.J. Thomson / tr. and ed. by George F. Barker. W.C. Röntgens grundlegende abhandlungen über die X-strahlen. Zum siebzigsten geburtstag des verfassers, herausgegeben von der Physikalisch-medizinischen gesellschaft in Würzburg. Mit 1 porträt. X-rays and the electric conductivity of gases : comprising papers by W.C. Röntgen (1895, 1896) J.J. Thomson and E. Rutherford (1896) / with an historical introd. by N. Feather. Zur Geschichte der Physik an der Iniversität Würzburg : Festrede zur Feier des dreihundert und zwölften Stiftungstages der Julius-Maxmilians-Universität, gehalten am 2ten Januar 1904. Röntgen rays centennial : exhibition on the occasion of the discovery of x-rays in Wurzburg on November 8, 1895. Röntgen und die Niederlande : ein Beitrag zur Biographie Wilhelm Conrad Röntgens / W.A.H. van Wylick. Rühmkorff, Röntgen, Regensburg : historische instrumente zur Gasentladung / Ein Seminarprojekt am Lehrstuhl für Wissenschaftsgeschichte der Universität Regensburg ; Unter Mitarbeit von Britta Görs et al.) ; Mit einem Beitrag von Markus Völk zur Röntgendiagnostik inregensburg heute ; vorgestellt von Christoph Meinel. The life of Wilhelm Conrad Röntgen, discoverer of the X ray, by W. Robert Nitske. The new rays of Professor Röntgen. Wilhelm Conrad Röntgen : Aufbruch ins Innere der Materie / Albrecht Fölsing. Wilhelm Conrad Röntgen : unsichtbares wird sichtbar / Petra Scheutzel. 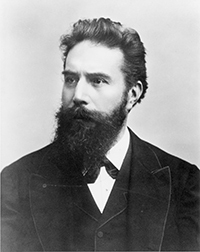 Wilhelm Conrad Röntgen and the early history of the Roentgen rays, by Otto Glasser. With a chapter, Personal reminiscences of W. C. Röntgen, by Margret Boveri. Wilhelm Conrad Röntgen Nobel Prize biography. Wilhelm Conrad Röntgen on a new kind of rays : a bibliographical study / Herbert S. Klickstein.